Rolex submariner green crystal paperweight. Matches with your Hulk 116610LV or 16610 50th anniversary. ROLEX PAPERWEIGHT IT WILL LOOK TERRIFIC AT YOUR DESK. This is made from a genuine Rolex Bucherer steel spoon. These spoons were given since the 1950´s to customers that bought a Rolex. 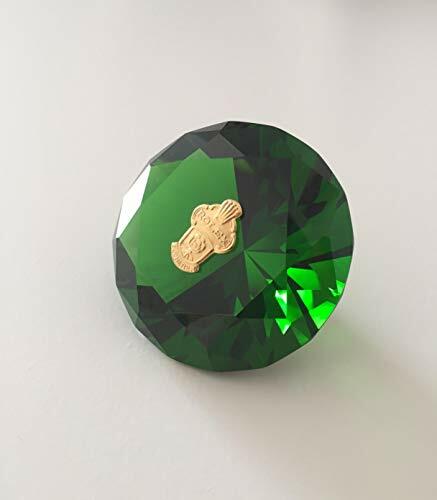 I have removed the piece from the spoon (very hard and takes time), sanded and polished the cutted base, then 24k pure yellow gold plated (not cheap) and finally attached with an specific super strong bi-component glue to the high quality green crystal. the bond will last virtually forever if it doesn´t receive shocks or a great pressure on it. Please take in mind that the steel piece is not perfect due to it´s own texture and some could have storage marks. Pay attention to the pics. The diameter of the paperweight is 80mm or 3 inches. Tracked shipping form Spain, Europe. It takes 3 to 5 weeks to arrive. I´m almost sure you will not pay custom fees as I don´t ship the packet with EMS or any express courier so this way takes longer to arrive but you reduce dramatically the chances to pay custom fees. Please note that I will not undervalue the goods sent. Returns are allowed if defective or not as described. Thank you!